Pierre-Henri Gourgeon, CEO of the AIR FRANCE KLM Group and Tan Wan Geng, President and Chief Executive Officer of China Southern, signed a joint venture agreement at Paris-Charles de Gaulle which will come into effect on 1 November 2015 and which is based on sharing revenues on the Paris-Guangzhou route. As a reminder, all Air France and China Southern flights between Paris and Guangzhou are operated on a code-share basis. Customers of both airlines therefore benefit from a wider choice of departure times and more frequencies. Several other connecting destinations beyond these two cities will gradually be introduced on a code-share basis within the framework of this joint venture. "This joint venture agreement strengthens the links which already exist between AirFrance and China Southern, who are also partners within the SkyTeam alliance. It consolidates our position in one of the most buoyant regions of the world and enables us to offer our customers improved service whilst maintaining costs. In this way, the Air France-KLM group is confirming its rank as European airline leader to China", declared Pierre-Henri Gourgeon. Air France and China Southern will have joint governance of the joint venture. A management committee will be implemented, with five working groups in charge of implementing the joint venture agreements in the fields of network management, revenue management, sales, products and finance. "By joining forces, China Southern – China's leading airline and Air France – a European major – are entering a new phase of cooperation. The joint venture will enable both airlines to improve their competitiveness on a very buoyant market", added Tan Wan Geng. Since 2004, Air France and China Southern have been operating code-share flights between Paris and Guangzhou thanks to an agreement signed in 2003. On this route, China Southern today uses its CZ code on Air France's three weekly flights and Air France uses its code on China Southern's four weekly flights, thus offering 7 code-share flights by Boeing 777-200 and Airbus A340. China Southern has also been operating a daily flight by Boeing 777-200, between Guangzhou and Amsterdam since 2001 on which KLM codeshares. KLM also operates a joint-venture with China Southern Airlines between Amsterdam and Beijing since June 2006. China Southern is the largest airline in the People's Republic of China for the past 31 years, headquartered at the new Guangzhou Baiyun International Airport (CAN). With a fleet of 400 modern aircraft, the airline serves destinations to 172 cities in 30 countries and regions, forming an extensive network with Guangzhou and Beijing as its hubs. In 2009, China Southern carried 66.28 million passengers with over 1,500 daily departures, which is the 4th largest airline in the world and the 1st in Asia. China Southern is a member of the global airline alliance SkyTeam. Together, the thirteen members offer its 385 million annual passengers a worldwide system of more than 12,500 daily flights covering 898 destinations in 169 countries. The AIR FRANCE KLM Group was set up in 2004 and comprises a holding company and two airlines that have retained their separate brands and identities. Together, AIR FRANCE and KLM serve an extensive global network structured around their hubs at Paris-Charles de Gaulle and Amsterdam-Schiphol. Currently, the group has a workforce of 104,000, carries 71.4 million passengers annually to 244 destinations worldwide, and operates a fleet of over 594 aircraft. 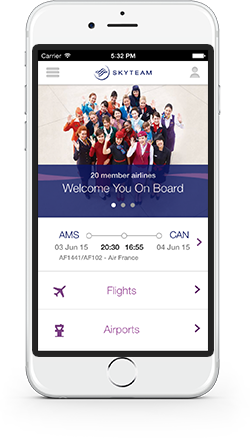 AIR FRANCE and KLM are members of the SkyTeam Alliance, whose services span the world. AIR FRANCE was founded in 1933, KLM in 1919.